Perfect for private parties and events. 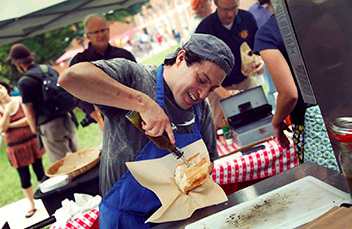 Since 2012, La Pampa is a “farm to street” mobile Argentine grill based in Yellow Springs, Ohio. 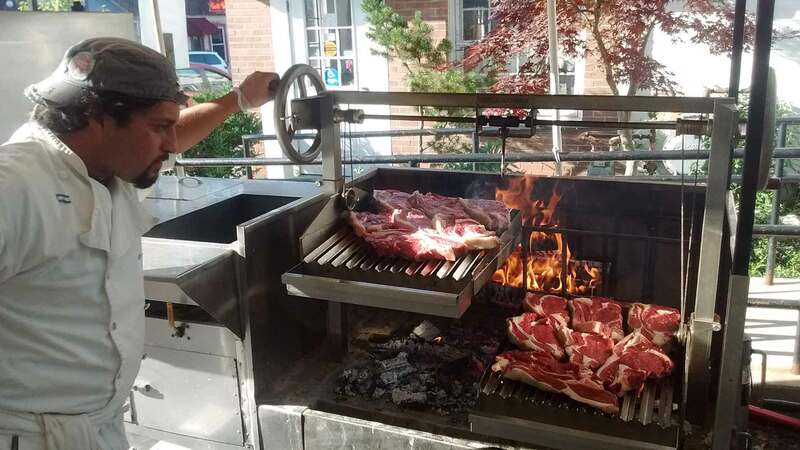 The soul of La Pampa is a verdaderamente Argentine grill from Grillworks, installed on the porch. 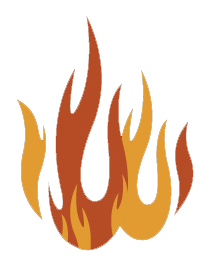 You’ll only be able to hear the crackling of the fire with our ultra-quiet Honda 7000 generator that won’t bother your neighbors—dream up your own party with La Pampa. Keep an eye out for our specials at area breweries and new Empanadas Argentinas. Our signature Choripan Argentine Sub and Wood Fired Steak always follow us to festivals, breweries and beyond. Mariano was born and raised in the region known as “la pampa” in Argentina. Mariano’s father worked herding sheep and cattle, and later as a professional butcher for many years. 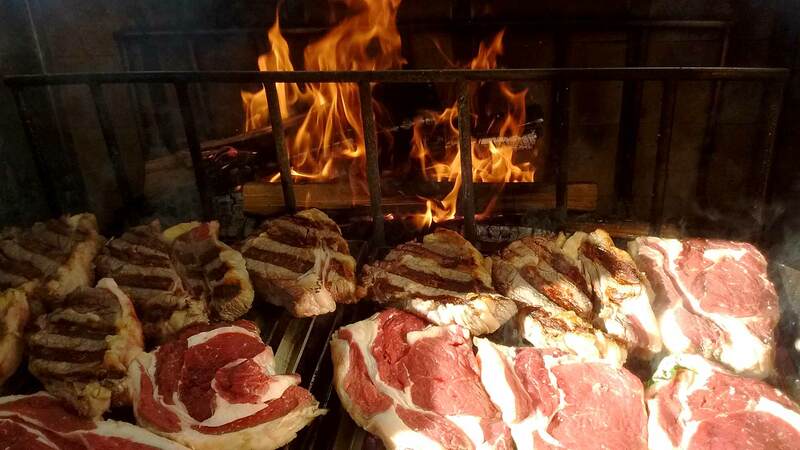 Although he has been a professional cook for nearly 20 years from Italy and Spain to the USA, Mariano learned the art of the “asado” and “parrilla” from his father, who always grilled the best whole cuts in his hometown. 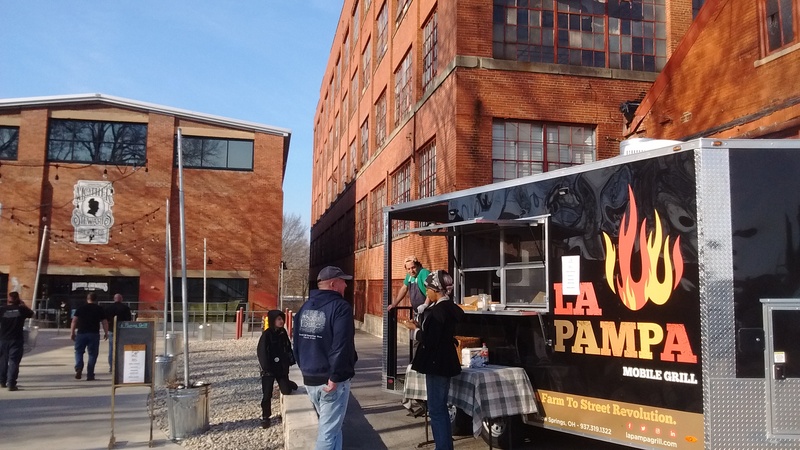 La Pampa Mobile is a converted food cart with a custom built Argentine grill from Grillworks in Ann Arbor, Michigan. We bring farm-to-street menus to area breweries, festivals, The Wellness Center at Antioch College, and Yellow Springs’ Peifer Orchards during apple season, among others. Our signature pork sausage “chori-pan” Argentine sub is prepared with a simple salt and pepper recipe, grilled and served on an organic baguette with chimichurri sauce. 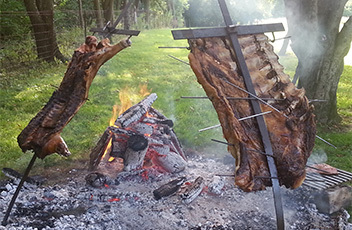 La Pampa brings the Argentine art of the BBQ, “el asado,” to private parties, weddings and events, where outdoor cooking lends itself to conversation around the fire and among friends. Preparing whole pork, lamb or sides of beef “al asador,” cooked vertically over radiating slow heat from a bed of coals brings out exquisite flavor. Ensuring high quality, we source our meat from Ohio area farms and cook onsite to bring it directly to the dinner line, hot off the grill. Sourcing a seasonal menu takes an ongoing commitment to local farms and creative skill to bring the freshest harvest to the fire. 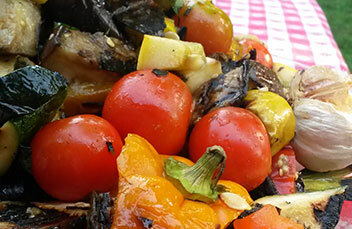 Depending on the growing season, La Pampa brings a variety of vegetables to the grill—from stuffed acorn squash to grilled onions, peppers, eggplant or zucchini with brown rice, or simply tossed with fresh tomatoes and olive oil. 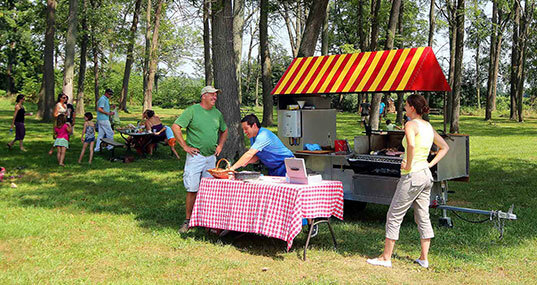 Seasonal dishes are prepared on the mobile grill, as well as added to the onsite cooking of La Pampa private parties. 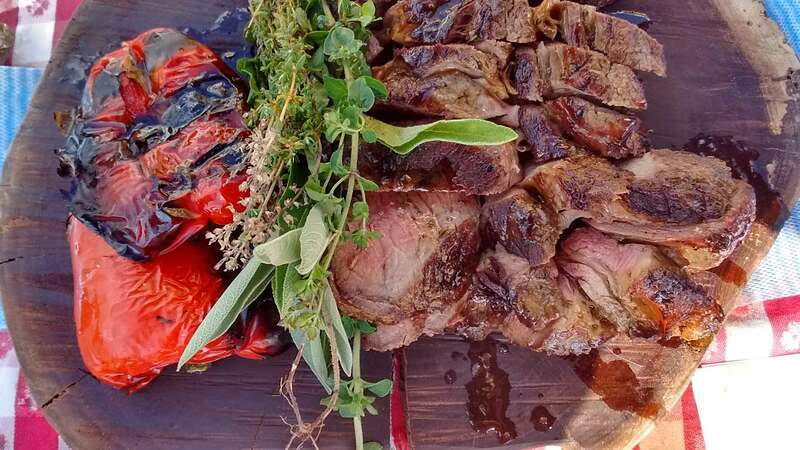 “La Pampa prepared my wedding rehearsal dinner and it was absolutely wonderful. I would recommend him for any event you are throwing big or small!